The Iron Chevsky Wine Blog: Everything is relative. Are you drinking the better wine? Everything is relative. Are you drinking the better wine? Forget trying to learn whether you like a wine or not by just ordering it in a restaurant or buying it in a shop, or even if you are lucky enough to be at an occasional dinner where several bottles of wine are served. The way to know what you really like is by going to tastings! Why? Because (almost) everything in life is relative. You might like something. But you might like something else better. And after trying the latter, you may not want the former. Doesn't mean the former is bad, but the latter is better. There are all kinds of reasons why in life we settle for “not-as-good”: cost, availability, and obliviousness to the variety. But cost and availability are often on par for many available choices. That’s where your awareness of the selection plays a crucial role. And that’s where there is no substitute for tasting, tasting, tasting. Did I say “tasting”? Tasting! Some people buy based on critics' scores. You have all seen those on the labels at your local BevMo, Trader Joe’s, Costco, supermarket, or wine shop. First of all, you need to calibrate what the critic likes against what you like. A critic’s rating of the quality of a wine often doesn’t reflect on the type, taste, or style of the wine, which means that you may not like it at all, even if it's rated highly. For instance, as far as the world’s most famous wine critic – Robert Parker (aka the "Wine Advocate") – goes, I don't normally like the wines he scores highly, because he tends to prefer very rich, strong and alcoholic wines. I think Wine Spectator is similar in that regard. 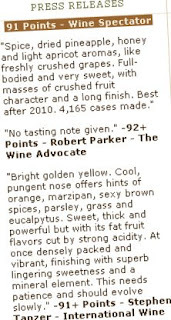 I like to think of critic’s scores as additional data points, but there is no way you should be buying simply based on a critic’s score or a wine description on a label, unless you’ve tasted many wines scored by that particular critic and trust their palate from personal experience. And you should certainly not be buying just because someone (even a friend) told you they like a particular wine. Your local wine shop most likely offers tastings. Good ones will do it several times per week. Even better ones (like Vineyardgate in Millbrae) will make careful selections of what is offered, in order to expand your palate, not just move the inventory that is not selling well. Tasting is a very small price to pay for expanding your awareness of wines, and thus helping you choose better wine for you. Tasting is also great because you get to hear other tasters’ opinions about what you are tasting, which helps you calibrate your palate in an environment focused on learning about wines, rather than just socializing (as would be the case in a wine bar, for instance). Sometimes a fellow taster's remark will nudge you to give a wine another chance - and after all, wine appreciation is an acquired taste - like certain foods (and people), give wines a chance to grow on you before moving to more obvious or familiar pastures. I don't know any wine connoisseur whose wine tastes remained static from the moment they began liking wine. The next step up from tasting at a wine shop is going to wine tasting events. For instance, the super-popular ZAP (Zinfandel Association of Producers) Good Eats event that takes place every January at Fort Mason in San Francisco. The more wines they have the better, but you absolutely must learn to spit the wine. In my early days, I just sipped the wines, and by the time I went through a dozen, I could no longer judge anything, plus I became a safety hazard, and I had a huge hang-over the next day (the subject of hang-over should be focus of a whole other post). But the goal of a tasting should be to expand your wine repertoire, not just drink or get immediate gratification. If you can get through 30-50 wines, while taking notes, and really thinking about what it is that you are tasting, you will be drinking far better wines in the future. Rudy Wiest German Riesling trade tasting in SF on Jan 26. 62 wines sampled. Great selection, with at least a dozen wines clearly deserving a place in my wine cellar. Had I had these wines individually, I probably would have found at least 2/3 of them very good. But tasting them side-by-side truly allowed me to identify the cream of the crop. Wine tasting events for general consumers can get quite expensive and the wine selections are often not as varied or exclusive as in your local wine shop – but they are a lot of fun, and often great food is paired with wines, as is the case at the ZAP event mentioned above. But if you are lucky enough to be in the wine trade, or can accompany someone who is, there are a lot of “trade tastings” all the time, and those are fantastic, because they cater to wine influencers, and so you really get more serious and interesting selections – typically latest vintages of great wines that the wine producers are marketing to retailers, restaurateurs and wine writers. Often the latest vintages are coupled with older vintages, to highlight and contrast the aging potential. And of course, if you read this blog, you know that I have a weakness for aged wines. 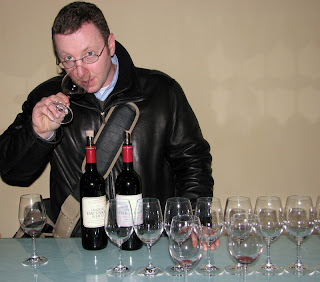 Brunello de Montalcino trade tasting in SF on Jan 22. I tasted 3 dozen solid Brunellos, but I really loved only a couple (all in comparison). Next, join a wine tasting group. If you ask your local wine shop guru, more likely than not he will be able to point you at one of the neighborhood wine tasting groups, like Ross Bott group in Palo Alto area. Wine tasting groups are usually a win-win for both the organizers and the tasters, because the organizers get to recoup the costs of their wines while enjoying them with appreciating audience, while the tasters get to taste taste taste, while paying a fraction of what it would cost to buy those bottles, even if they could find them, which in many cases (especially of old vintages) they can’t. Another way is wine touring. Make wine touring a part of your vacation, but treat it seriously, not a way to hang out in Napa Valley – but a way to learn about wines – make appointments, tell the winery that you are a student of wine, take notes while tasting, and make sure you spit the wine. If the winery staff see that you are serious about wine, oftentimes they will bring out the “good stuff” – their higher-end and more treasured bottlings. I found that to be particularly true for France, while Napa remains more touristy and commercial in my view, where it's harder for a mere mortal to get a meeting with the winemaker (which is a pity). One down-side of wine touring is that it gives you a sense only of a particular area, and you have to spend weeks, months, and years touring in order to get enough breadth, and by that time of course, the wines and wineries you tried may have changed their style, as well as the there could be dramatic differences from vintage to vintage. In that regard, wine shop tastings, consumer and trade tasting events and local tasting groups are a lot more immediate way to learn. Please let me know what tricks *you* use to expand your tasting repertoire. Nice post Gary. I find Parker to be consistent and his descriptions, not his opinion, accurate in some senses. So whether you agree or not, you know what you're getting. I actually think tastings are generally a bargain, maybe not when you measure ounce by ounce but when you think what it would cost to buy full bottles to find that you didn't like something... They are also a way to support retailers, who desperately need it now. What if all we had were Costco and Bevmo? Lastly, if you are into wine, visiting the regions is extremely rewarding and not comparable to tastings. Tasting Corton-Charlemagne in Pernand is completely different from tasting it in a stained glass after trying 10 other wines, standing shoulder to shoulder with the guy next to you. I love the new wine and new tasting bars. It's my passion to drink the new kind of wine brands. Next time you should invite me our wine tasting ceremony. Bordeaux is not that complicated… is it?